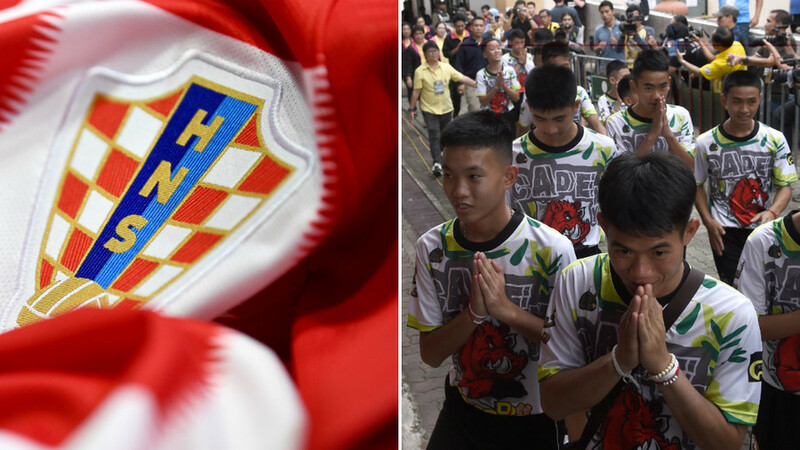 The Croatian football federation (HNS) has sent team jerseys to each of the 12 Thai youngsters who were recently rescued from a cave after being trapped for more than two weeks. The youngsters, aged 11 to 16 and all from the same football team, were rescued last week along with their coach after spending more than two weeks stranded in flooded caves in the Thai province of Chiang Rai. They appeared at a press conference on Wednesday in which they described their ordeal, as well as posing in their ‘Wild Boars’ team kit. The youngsters will now have more kit to train in after the Croatian football federation sent the boys 12 jerseys in the distinctive red and white checkered pattern of the type worn by the World Cup finalists. The youngsters’ plight came to the attention of the world after they went missing on June 23, eventually being found by divers on July 2. A complex rescue mission was launched during which one former Thai Navy Seal, Saman Kunan, died. French star Paul Pogba dedicated his team’s semi-final win against Belgium to the youngsters, after it emerged on the day of the game that they had been safely rescued.